You are here: Home » Commodity ETFs » How Far Will Gold Fall? If you hadn’t already noticed, the price of gold is in a nose dive. Just take a look at this chart of the SPDR Gold Shares (GLD). GLD is an ETF that replicates the performance of gold bullion. As you can see, GLD has been moving lower since it made a high of $133.69 in March. At a current price of $118.59, gold prices have fallen 11.5% below the high of the year. And the worst part is the selloff has picked up steam lately. GLD is down more than 5% in just the last month, it fell below the June low around $120, and it has been down five days in a row. Needless to say, GLD’s recent performance is horrible. What’s going on with the shiny yellow metal? Simply put, gold is out of favor with investors. Don’t forget that gold’s day in the sun came during the financial crisis and the years immediately after. But the dire predictions of the economic meltdown and destruction of fiat currency never happened. Now, after years of underperformance, traders no longer speculate as much on gold prices and regular investors have gone onto chasing the performance of the next hot investment. 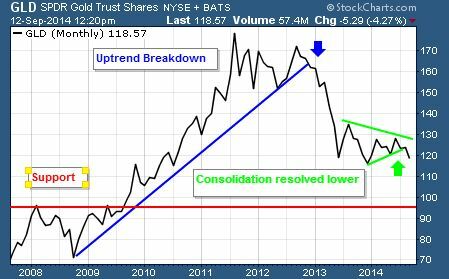 You see, charting the price history of gold over the last seven years shows a bearish technical breakdown in gold prices. 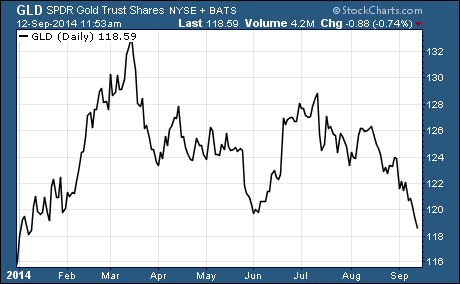 This chart shows GLD made its all-time high in mid-2011. But the uptrend didn’t end until closer to the end of 2012 when it broke decisively below the upward trending support (blue line). Gold has no intrinsic value. It doesn’t do anything. So it’s uniquely beholden to technical analysis in a way other investments that have fundamental data are not. And right now the technical picture for gold is extremely bearish. Right now GLL trades for $94.33. It has the potential to move 10% higher as gold prices test their 2013 low. And if gold retests the next major support around $100, then GLL stands to surge more than 30%!